This computer was the portable version of the PC XT. 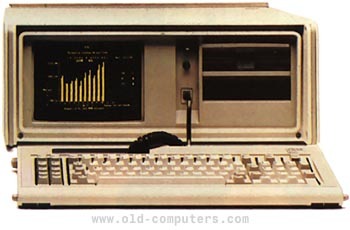 The OS was the PC-DOS 2.1, first delivered with the PC Junior. The portable was equipped with a 9'' amber screen which could display texts and graphics. It offered 7 extension slots, 5 being free (4 shorts and only 1 long). The main drawback of the Portable is that it was not delivered with a hard-disk, and it weights a lot (30lbs) !. On the other hand, it used the same mother board as the IBM 5150 (the classic PC form factor). This enable an such enclined person to be able to upgrade this computer up to a Pentium II ! The portable PC XT was my first �laptop� computer, and as an owner of a modern portable today, thinking back about this one just blows my mind. I was an IBM Information Developer at the time writing the User�s Guide for the XT and I was doing it on this beast � in a text file and in IBM Script which looks a lot like HTML today. But the interesting part of this story is that I had taken the box home to work � yes, I was one of the first work-at-homers to try it out � and while trying to get it up to the den I DROPPED IT DOWN THE STAIRS. It really weighed what felt like a ton, and after lugging it all the way home I was worn out, and must have let the handle slip through my sweaty grip. Well, the box bounced down at least 30 steps or so end over end while I watched in horror, already calculating how I would explain this to my boss, who already thought I was a freak because I wanted to illustrate the user�s guides with a yellow duck. To my amazement, I took the portable apart, reseated all the cards, and it powered right back up. Good as new. Try that today with a portable computer! see more IBM PC Portable - Model 5155 Ebay auctions !